Web based help desk in 15 minutes. Web based help desk software. Single interface to manage all trouble tickets coming from email, support site, web forms, phone, fax and snail mail. No downloads. No programming knowledge is needed. Instant activation and monthly fee as low as $19.95 per operator seat. Receiving loads of inquiries? Need to answer them with a team of agents? Launch your own web help desk now! No credit card required. No obligation to purchase. No risk. Have you ever happened to be writing an e-mail reply to a customer inquiry and by the time you have hit send button, another member of your team has already dealt with the problem? It happens all the time because generic email system is not intended to operate in a "groupware" mode. The help desk system eliminates the problem, as it requires claiming an ownership over a trouble ticket before ever starting to compose an answer and ensures that no ticket may be assigned to more than one operator. The problem tracking system ensures also that no ticket ever goes unanswered: if an inquiry was not taken by an operator for a predefined period of time, the ticket escalation rules will promote such request to the attention of upper service tier members. No need to install and maintain additional software: web based help desk allows your customers to submit requests 24/7 from anywhere in the world. Your staff can access the system 24/7 from anywhere in the world. 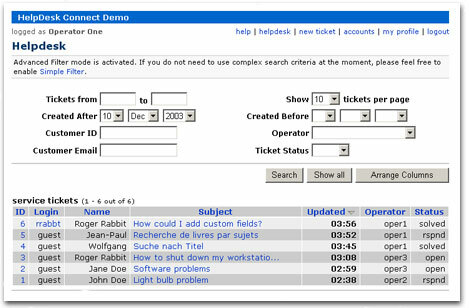 Creating a trouble ticket is as easy as submitting a web form or sending an email, while the help desk software ensures that each service request is assigned a unique number and saved in the MySQL database to review at anytime in the future. Instant Up & Running. No downloads. No web hosting account. No software to install. Register, review default settings, copy & paste html code - your own customer service web site may be running in 15 minutes. Or even less. Cost effective. An operator seat monthly fee is only $19.95. Add licenses as your business grows. Cancel unused operator seats during off peak months. It is absolutely risk free customer service solution, as we offer a free trial. Try before buying. Serve first 20 requests for free1. No credit card required. No obligation to purchase. Even no need to cancel your account. Try our Demo or setup your own web based help desk now! 1 30 days limit applies. Bulletin board style communications. Each trouble ticket may consist of unlimited number of messages. Simplified markup tags allow to control text appearance (bold, italic, underline, code) and to insert html links and images. Any message may be marked as hidden to facilitate internal communications and notes. Registration is optional, as anonymous (guest) visitors may access their tickets using unique access keys. Dynamic FAQ Entries Share knowledge at a speed of light. The very moment a problem is solved, the solution may be published in a searchable knowledge database. Do not waste your time answering the same questions again and again. Do not force your customers to waste their time asking questions answered before! Customizable Views. Choose what information you want to see while browsing tickets and customer accounts. Highly customizable interface using embedded WYSIWYG HTML editor. Message editor with support for text proofing and message drafts. File attachments. A file of any type may be added to any message. Reporting. Track operator performance and customer activity. Prepare customer and operator timesheets. Email based ticket submission with support for html-only messages and multiple file attachments. Intelligent ticket routing using departments and 4 tiers escalation model. Manual and automated escalation supported. Dashboard - home page for your customer service site. An ideal place for your announcements, quick links and personalized information. Highly customizable template with support for simple macro language allows serving dynamic content based on customer account information. Customer database for easy tracking of customer details like contact info or service options. Custom fields. Both ticket and customer databases support up to 10 user definable fields to keep additional information. Each field may be configured as a text, select menu or checkbox. Supported attributes: hidden, read-only, mandatory. Multilingual Support. Automated language detection using encoding info captured from email headers. Direct urls to access your customer service web site using different languages. Live help. Chat with your customers and monitor your web site visitors in real time. High availability. Two node failover cluster to ensure uninterruptible operations. © Rush Project Inc. All rights reserved.